I got so excited to start this project I forget to take a before picture. Imagine dark brown thick wood, reminescent of a 1980’s waterbed set. I’ll finish it this weekend, I need to get a few more pieces to fill in, maybe embellish the sides too. Oh, WOW!!! I LOVE those old flower pins, I only have a few. That is already completely gorgeous. You are so talented and clever. I love reading your blog and seeing all of your beautiful creations and ideas. Got to catch my breath.. It’s already looking wonderful. How amazing will it be when it’s finished?! Love those vintage pins, and so many colorful pieces together. It’s a mirror that will make you smile! It is going to be AWESOME when you are done. So pretty! I was in LOVE with the last one you made. I’m already drooling over this one as well. Oh! This is going to be marvelous when you finish it!! WOW! What an awesome idea. This is such a great craft project. I love all the wonderful flowers and little details you added. I do hope you post another picture of the completed project. Nice job! What a wonderful project! You are truly talented!! 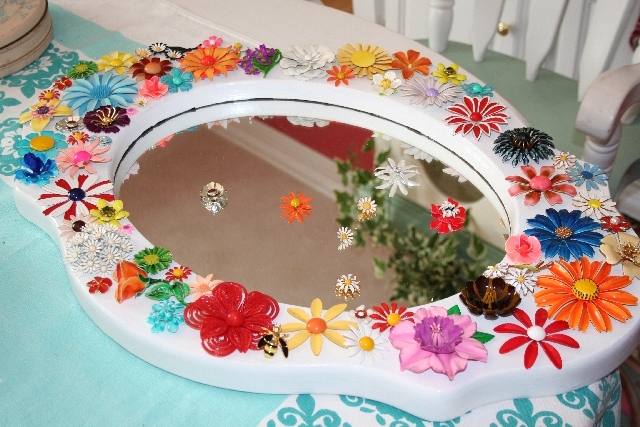 I’ve never seen so many beautiful enamel flowers all together!! 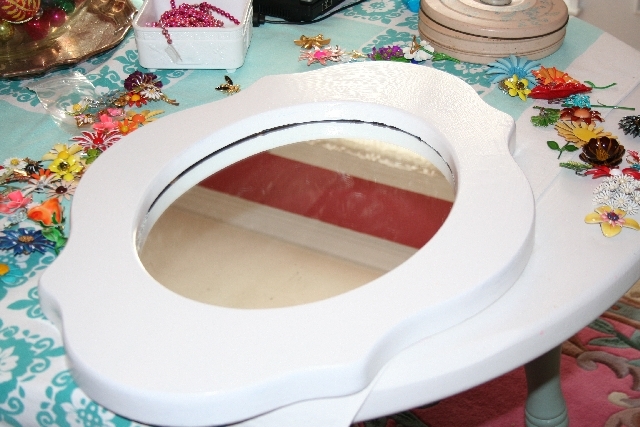 Looks like a really fun project – bet you can’t wait to see the end result – I know I can’t! OOh La La! Very pretty. It looks like something you should be able to eat! Oh and I can well imagine that 1980s waterbed thing because that is sadly my bed. DH won’t part with it or let me paint it… uggghhh! You surely won’t be able to part with that one, now will you? Love it and can’t wait to see it completed. Wow! I am at a loss for words! Another beautiful project…I LOVE enamel flower pins. This mirror is FABULOUS! 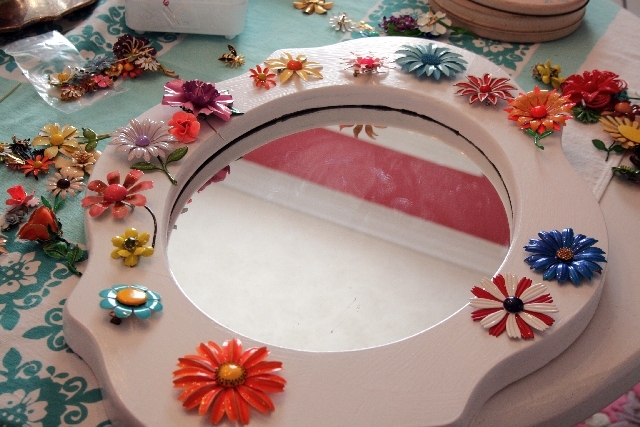 your goodies are en route and may even be with you by tomorrow… the better to finish your fab mirror with! i am so jealous. you know how much i love the earring ones. perhaps i can stop my own variation of madness long enough to make one for my own self. ha! i think i will just dream about yours. 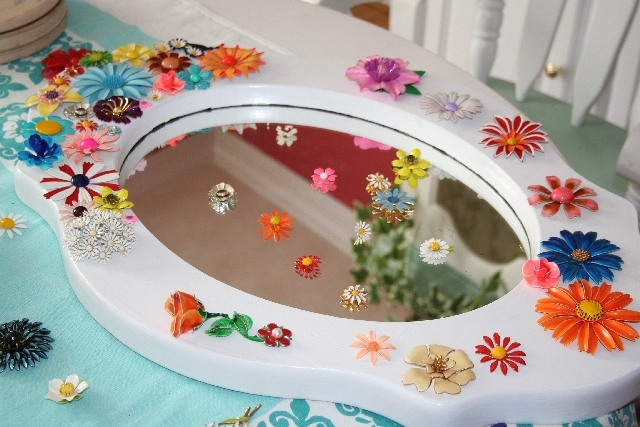 Cool…another fun & gorgeous mirror – so pretty! I happened into a vintage jewelry store today to check it out & I almost fell over at the price of those colorful flower pins – $45 for just one! Oh, Yes, I can picture the water bed frame before! great transformation. I just saw this on the Craft blog and fell in love! I have so many of these pins that just sit dormant in a jewelry box this is the perfect way to display them.